Skkynet | What Drives Industry in 2017? You are here: Home / Blog / Blog Entry / What Drives Industry in 2017? What Drives Industry in 2017? It’s big. It’s by far the biggest industrial automation show in Germany, in Europe, and possibly in the world. It’s SPS IPC Drives. “SPS” is German for PLC (Programmable Logic Controller), “IPC” stands for Industrial Process Control, and “Drives” are tools that control the speed of machinery. It comprises a dozen exhibition halls, each one practically a trade show in itself, filled with gigantic, colorful booths displaying robots, machines, and control system components. It’s where thousands of engineers, system integrators, machine builders and parts vendors gather for a massive show-and-tell featuring the latest and greatest—sensors, actuators, controllers, software, services and more. The Cogent/Skkynet display was part of the OPC Foundation exhibit at the show, in the communications technologies hall. We had a demo of our completely integrated solution for Industrial IoT data communication and OPC UA (Unified Architecture), from embedded devices with ETK, to the factory floor with DataHub, to our SkkyHub service running in the cloud. We attracted plenty of interest, particularly for our ability to access data from inside a plant without opening any firewall ports, and using no VPNs. Other exhibits featured IoT, and a few had working demos similar to ours, showing how they could put data from a sensor into the cloud. But there were significant differences. Most of them did not have bidirectional communication, and all of them had to make compromises on security and robust connectivity. The two technologies most frequently mentioned for data communications were OPC UA and MQTT. Most users are finding out that OPC UA by itself cannot serve as an IIoT protocol, because like every industrial protocol, it functions on a client-server basis. An OPC UA client outside the plant needs an open firewall port at the plant to connect to an OPC UA server inside. This is inherently insecure, since any hacker could also enter the plant through that open firewall port. To surmount this obstacle, a number of companies have turned to the MQTT messaging protocol. Its publish/subscibe architecture allows it to make outbound connections. That does keep firewall ports closed, but MQTT is not suitable for IIoT for other reasons. Notably, it cannot guarantee data consistency. Finding out that there is another way opened a few eyes. 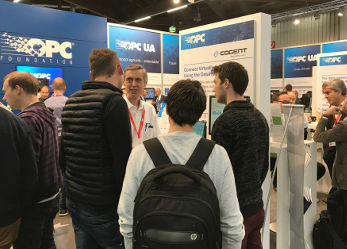 People coming to our booth and those we met throughout the show were surprised and pleased to find out that there actually is a way to maintain a secure, robust connection for IIoT. There is no need to open any firewall ports or to use a VPN, and yet you can guarantee consistency of the data between the server and the client. All you need is the right technology, secure by design. Our task for the coming months is to continue sharing this message with the 1500+ exhibitors and 70,000+ visitors at SPS IPC Drives, along with anyone else who wants to connect industrial process control systems to the IoT. https://skkynet.com/media/2017/12/Blog-SPS2017.jpg 340 999 Bob McIlvride https://skkynet.com/media/skkynet-logo.svg Bob McIlvride2017-12-06 03:00:082018-05-21 17:26:56What Drives Industry in 2017?